There are just so many things we need to handle each day and it is challenging to find time to keep our body, mind and soul healthy at all times. However, we all know that in order to maintain peak performance and to achieve remarkable success, we need to recharge ourselves regularly so that we can have all the energy we want to do things and to start afresh. Our bodies and energy function just like the phones, we need to recharge ourselves from time to time to prevent burnout and also to maintain our work performance. Imagine you don’t take enough sleep each day, you are feeling tired and sleepy in the daytime when you are working. Do you think you are able to perform and do your best at work in this condition? An article about the negative effects of sleep deprivation has been published on Healthline. The article states that the long-term effects of sleep deprivation are real and it drains our mental abilities and puts our physical health at real risk. Many health studies have also confirmed that when we did not get enough sleep, especially over the long-term, can cause many health problems, weight gain, weak memory, poor thinking and concentration, and also mood swing. My friend, getting yourself recharged is not just about getting enough sleep. It is about maintaining a wellbeing from all aspects, your mind, physical body, and your soul. Imagine if you are able to maintain and work at your peak state every single day, don’t you think you are able to produce better work that creates more significant result? As a blogger, there are days when I feel totally tired and difficult to think creatively how to put the words into sentences. There are also times when I feel totally motivated and fired up to type. And during these times, I feel like I’m the most productive person ever. This is why you need to learn how to recharge yourself. Regardless of what job or industry you are in, if you want to produce extraordinary results, you must first make sure you are in the peak state to do so. Whenever you are feeling tired, no motivation, and have no energy and drive to work on your goals, stop and recharge yourself. Trust me, my friend, when you are in the peak state and are feeling absolutely motivated to do things, you can accomplish much more. On the other hand, when you are not feeling motivated and in a slump mood, do something to recharge so that you can get back up as soon as possible. 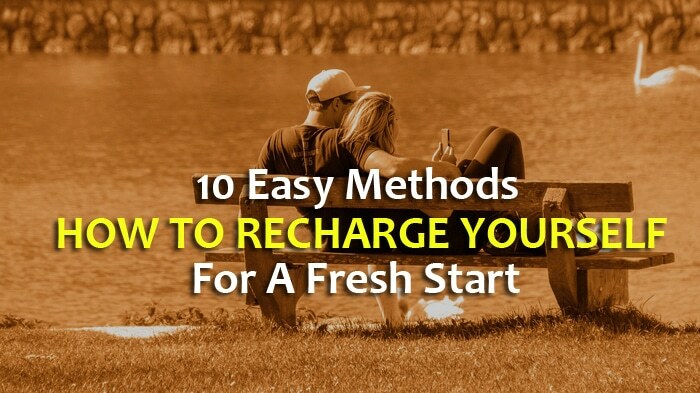 So here are the 10 methods how you can recharge yourself fast and have a fresh start. This is obviously one of the best ways to recharge yourself quickly when you are feeling no motivation. Take 5 or 10 minutes to review your goals and your plans. Revisit your purpose allows you to reconnect yourself with your deeper meaning. And when you know why you want to do what you want to do, you gain clarity and clarity gives you the focus you need to get motivated again. Some people don’t think that this is a good way to recharge. I don’t agree. Recharge can also mean that you spend time reconnecting with what you want in your life. It does not have to always be something unrelated such as watching a movie or taking a vacation. Recharging can also come in the form of reconnecting with your deeper self and meaning. Every time I take a look at my goals and my plans, I feel the surge of energy coming from within because I reminded myself of my goals and the kind of life I want to live. No matter who you are, there will be days when you feel totally no motivation to do things at all. Since you are so tired and have no motivation at all, why don’t you just resolve and take a good rest? Mornings are my most productive time. I use my mornings to write content because I’m the most creative during these times. However, when it comes to the afternoon, I feel that it is a little challenging for me to stay focus on my work. I will get distracted easily. And sometimes, after my lunch, I feel sleepy. Whenever I feel sleepy in the afternoon, I choose to take a short power nap. For about 15 to 20 minutes, I take a short nap on my couch next to my workstation. And every time after the power nap, I feel so much more awake and alert. I feel refreshed and totally recharged. So try to take a short power nap to recharge and boost your motivation. Read this article to learn how to take power naps. Do I need to further explain myself on this? We all know that exercise is good for our physical and mental health. And exercise is a great way to recharge. Previously, I published an article on the 4 ways how exercise and improves your mental health, you can read it here. Exercise can improve your mood. Even within 5 minutes after carrying out a mild physical activity, you will notice the positive effect of the exercise on your mood. You have to understand that our bodies and our minds are NOT 2 different entities. They are both connected and one controls the other. When you exercise and sweat, your blood circulation increase and your heart pump more blood to your brain. This will directly affect your thinking and sharpen your brain. If you read the book, What The Most Successful People Do Before Breakfast, you will understand that most highly successful people use their mornings to exercise. This is not a coincidence, but a science. Exercise has many benefits. It helps improve your mental strength and at the same time, recharge your body, mind, and soul. Do you know that volunteering and helping out can boost your mood? It can recharge you and at the same time, make you feel great. Of course, volunteering and helping out needs to connect correctly with your soul. If you don’t like cooking, probably you won’t feel much if you volunteer to be a chef and to cook for the needy. You must identify your interest and connect what you do with it. For instance, if you are someone outgoing and you love nature, helping out in the community to clean up the forest can be a good choice. Thus, choose the right platform to volunteer. Volunteering yourself is good especially during the weekends when you have nothing much to do. It can recharge you for the coming week and give you a fresh start. This is what I love to do as a way to recharge myself. It may sound odd at first, but when you think about it, declutter and organize your workplace or home allow you to free your mind. You can get off whatever that is blocking your way physically and mentally. Every time after I clean up my house, I feel good. I feel lighter and that I’m ready for what’s coming in the future. You don’t want things to distract and block you on your journey to success. Your goals are like the targets. 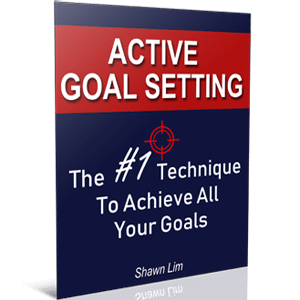 And when you are trying to fire an arrow towards your goal, you want to make sure there are no distractions or anything that is blocking you from reaching your target. Therefore, try to declutter and organize your life from each area. It can be your living area, your workplace, your relationship, your desktop, etc. After you do that, you feel lighter and fresher. You feel recharged and are ready to face the world once again. This is another good way to recharge yourself. By filling your day with gratitude, you will feel great and that it opens up your mind to all kinds of possibilities. Science has proven that the feeling of gratefulness can reduce your levels of depression, cures anxiety, insomnia, and even physical illness. One quick way to fill your day with gratitude is by listing down 10 things that you are grateful for. Just take out a piece of paper and write down the 10 things that you appreciate in your life right now. It can be anything from your spouse, your house, your car, your cat, your life, your parents who are still healthy, your computer, etc. Now, while you are writing down the list, don’t just write it for the sake of writing it. Spend a few seconds or a minute or so to think about the things that you have just written down. Feel grateful that they are there in your life all these while. What truly makes you feel grateful is your feelings, not the act of writing. As for me, I don’t write them down. Instead, I choose to take a few minutes to be in solitude and think about my life and what I appreciate. Usually, I will just get over to my balcony and imagine all the great things that I have in life. I imagine and feel thankful that my wife is with me all these moments. I feel great that I’m still able to breathe and think and are healthy to pursue my goals. I just give myself time to think and appreciate my life. If you think that writing down your gratitude list is a better way, by all means, go for it. I believe that everyone’s method of feeling gratefulness is different. So just go according to your own method. I love the idea of having a getaway. A lot of people think that having an escape is going to take them a lot of time, it really does not need to be this way. You don’t have to travel overseas or go somewhere for a short vacation for a few days if you don’t want to. Just get away from your usual ‘base’ can recharge yourself. For example, sometimes, when I’m feeling tired and difficult to concentrate after my lunch, I choose to get away from the workplace and get to the local coffee house like Starbucks. The moment I move my body, I change my emotions. The key to a getaway is to change your physical motion so that you will experience a different emotion. Of course, if time and budget allow, you may want to consider a short trip somewhere to fully recharge yourself. However, make sure you choose the right place to recharge. If you go to a busy and crowded shopping mall, at the end of the day, you will feel exhausted more than recharged. Choose a place that can boost your soul and improve your mood. Get close to nature is also a good suggestion. Here are 5 easy ways to recharge yourself with a weekend getaway from HuffingtonPost. We all know that what we put into our mouths directly affect our health. What we eat can greatly affect our mood and emotions. If you don’t believe this, try to eat junk foods take in a lot of sugar as lunch, you will feel tired, sleepy, and unable to concentrate on your work after that. Although there are foods that we should avoid, from time to time, we should still pamper ourselves with good food. Study has found that chocolate can help improve your mood, make you feel calmer and more content. The article also states that dark chocolate stimulates the production of endorphins, the chemicals in your brain that makes you feel good. You have to understand that everything in moderation is fine, but when you overdo or overeat, the effect can become the opposite. Having too much chocolate with saturated fat raises your cholesterol and increase your risk for stroke and heart disease. Too much of a good thing can be something bad. A little alcohol can be fun, too much of it can be dangerous. A little gamble is fun, too much of it can ruin your life. So eat in moderation. And once a while, pamper yourself with good food that can recharge your soul and elevate your mood. Imagine that you are living by the seaside. Your house is surrounded by flowers and trees. And as you lift up your head, you can clearly see the beach not too far away from your house. You can hear the birds chirping, see the sun reflected on the surface of the sea, and you can feel the gentle breeze hitting your face. How nice and recharging is that? This is what nature can do to us. Scientists have discovered that getting close to nature has many benefits. Somehow, we feel calm when we are surrounded by nature. The fresh air allows us to think clearly and the gentle breeze makes us forget about our problems. This is why getting close to nature is one of the best ways to recharge yourself. Schedule time for a getaway and stay close to nature each week. Highly successful people choose to jog and run in the morning when the air is fresh atmosphere is quiet and refreshing. This article from The Guardian shares 20 great tips to get closer to nature. For instance, you can take a walk in the forest or the garden, become a tree hugger, hide and see the birds, build a forest home, picnic in the shade, sleep among the trees, and much, much more. Spending time with nature can be uplifting. It can boost your mood and make recharge you both physically and mentally. Hence, arrange a time and make schedules to be with nature. Finally, in order to recharge yourself, you can get unplugged and do something else. For example, if you are working but you feel tired and no motivation to work, just take a short break and do something else that is not related to your work, and then come back later. Every time when I run out of ideas, feeling tired, no motivation, and have no creativity to continue to write articles, I will just take a short break and do something else. I read books, play some games, talk to someone, watch an uplifting YouTube video, or take a power nap. And after that, I feel recharged and are able to work on my article again. Try it. But make sure you choose to do something that is unrelated to your current work because you want to free your mind and get away from the stress. It is like how Archimedes discovered the principle of buoyancy while taking bath. When you let go and unplugged, you allow your mind to work on the problem on a subconscious level. And at any random moment, ideas and solutions can come to you. And those are your Eureka moments. After going through these 10 methods, I believe that you should know what you can do to recharge yourself each day. Remember, recharging yourself is important. If you try to go the extra mile without recharging yourself, you will eventually suffer burnout like your phone running out of battery. Do you have any other idea to recharge yourself? Do share with me in the comment section below. Cheers.